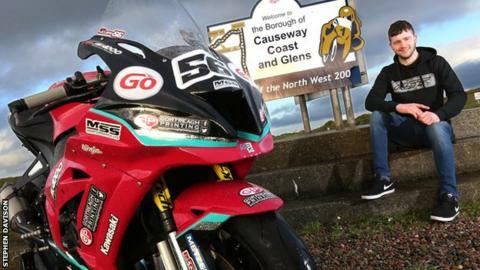 Northern Ireland road racer Adam McLean says he is still getting to grips with his Kawasaki Superbike as he sets out on the 2019 season with McAdoo Racing. McLean, 23, has mostly focused his efforts on the Supersport and Supertwin machines during his career so far. "I am still learning my way around the ZX-10RR Superbike," admitted McLean. "At the minute it is really taking me for a sail. I know it can take two or three years to get to grips with a superbike. I'm not panicking." "My priority is to get lots of miles in during testing and learn," added the Tobermore rider, who clinched second and third places at the opening round of the Ulster Superbike Championship short circuit series at Bishopscourt on 30 March. Having won the Best Newcomer Award at the 2017 Isle of Man TT, McLean is beginning his second season with the vastly experienced Cookstown-based McAdoo Racing outfit. He is hoping for better fortune than he experienced last year at the opening international road race of the season, the North West 200. "I had no luck at last year's North West. I only finished one race, taking a fourth place in the Supertwin event," recalled McLean, who suffered a heavy fall from his Roy Hanna-backed ER6 Kawasaki when he clipped a kerb on the exit of Juniper Hill chicane during the final qualifying session. Two years ago McLean achieved his best finish to date over the 8.9-mile Triangle circuit when he came home fourth in the Saturday Supersport event. That impressive result helped secure his ride with the manufacturer-supported Kawasaki squad owned by father and son, Winston and Jason McAdoo. "I've shown I have the pace for some decent results.' McLean says. "I just need to bring it all together to get some solid results." During 2018 the County Londonderry rider was a regular podium finisher in the Supersport races at the Irish National events but faced his biggest challenge after his McAdoo team-mate, Yorkshireman James Cowton, lost his life in a crash at last year's Southern 100 on the Isle of Man. "I felt really down after what happened to James," explained McLean, who was competing in the same race when the accident happened and was reported to be considering his future in the sport as a result. "I wanted to race on and at the Ulster Grand Prix I put the visor down and rode the best that I've done in my career," he said. That determination produced a Dundrod victory in the Supertwins race, McLean's first international road race success. He followed that up with second and fourth place finishes in the two Supersport races.